This day was supposedly monumental for me for a lot of good things happened to my blog today. I was really glad that finally, after a long time I finally have a .com! Yes my blog is now a thebargaindoll.com :D I finally own the domain name I have been dreaming of. :D Yay! Well, the second post may seem mababaw to a lot of you but I'm glad that even for a day, I ranked high on top blogs (which my blog don't get to reach often). I'm really glad that ranked quite high today but whether or not my ranking is high, I will forever be thankful for those people who visit my blog every now and then. I was supposed to sleep now but I couldn't find that peace of mind until I air what I feel. If you have been following me on twitter, you have probably read about my (almost an hour long) rant on this certain blogger (whom I chose not to reveal) who insulted my comment on her blog post. I personally don't know this blogger but I am fond of joining Comment Exchange groups so I could blog hop and attract blog trafffic too. I usually like exchanging comments to other bloggers as I get to discover a lot of good things on their blogs. This certain blog link was on a facebook group of bloggers (that I thought was a group for comment exchange) and it was my first time to comment on her site. Her post was a long, personal post (that admittedly, I wasn't able to read thoroughly) and I left a very short comment on her post. I find the post very interesting, however due to the limited time I have in my hands, I quickly left a short comment on that post. Unfortunately, the blogger found my comment completely unrelated to her supposedly personal post and decided to screen cap it and posted it on her Facebook status, calling it plastic / spam / stupid. A common friend showed me a screencap of her status which made me burst into tears seconds after reading it. I couldn't believe I'd be humiliated like that. I felt offended cause I never had any bad intentions on leaving a comment to her site. I do not know what I did to her but it was a one liner happy comment that ends with my blog link and a couple of smileys. I could have entered a wrong comment, or the comment was not enough to compliment the post in her opinion). Still, it was a bit hurtful from a viewpoint of a reader / blogger who took time to visit a certain site, who gave a sincere (not bad) comment would be humiliated and bashed like that. I felt a bit disrespected and insulted for being bashed on something I did not do. I do not know if this blogger is popular or not, but I respect every blogger regardless of the ranks. I do believe that each blogger spends time updating his / her blog and it would be an honor to receive a comment, a visit, a hi or whatsoever on a certain post. I frequently receive a lot of unrelated, hate comments or even follow me back comments myself but I never bash any of them. Instead, I am thankful for each and every visit my blog gets. As a good friend said to me, a comment is an affirmation, whether long or short, with or without effort. This may be a lesson learned for me, that not all bloggers are appreciative of their readers. 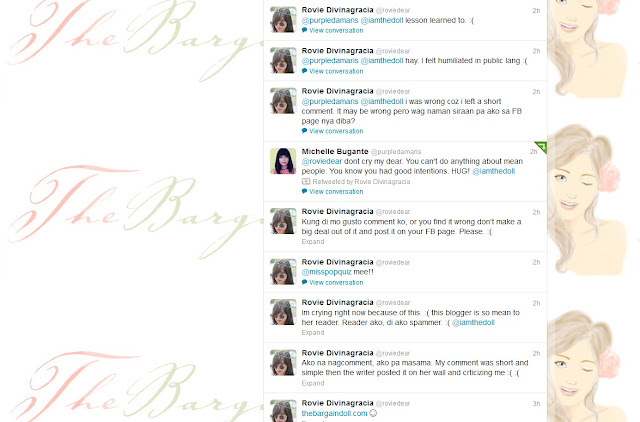 I really believe that each bloggers should treat fellow bloggers and most especially readers with respect. We may not like the comments we're getting, we might get a lot of unrelated comments or even insulting ones, (unless its very degrading and life threatening) but it is part of our life as a blogger. e respect others' opinion and value it. And I should probably be more careful of what I comment into. I tend to leave short comments (cause I'm always short of time) but I sincerely visit blogs every now and then. For those blogs who I leave short comments on, I apologize. I'd spend more time reading your posts more. But I wouldn't let this affect me. I hope that person would realize how inappropriate her action is and not do it to future visitors of her site. On the other hand, I'd rather focus on things that are worth my time and attention. I am really sorry for troubling you guys with this long and personal post. This is the first time that happened to me and it's really a lesson learned. I'm really happy that a lot of my blogger friends were there for me tonight. You guys know who you are, and I'm really thankful for everything. O eto isang maiksing comment para sayo : We love you! Hahaha! :) Itulog mo na lang yan at palipasin. a comment is an affirmation, whether long or short, with or without effort. > This. I think we should celebrate together for connecting our domain (irishracelis.com) on our blogger account :) Although I've been using my domain for almost two years now, I just transferred to blogger platform. Still, I feel like a noob. I feel bad about the issue. I won't be siding with anyone because I think both parties are wrong: She shouldn't have humiliated you and you shouldn't have posted a comment if you didn't read the post at all. My advise is, if you think your comment will be unrelated with the topic, don't post it anymore. Don't worry about the issue anymore. In fact, it's a nice publicity too since I stumbled here because of that. First of all, I would like to congratulate for you for the .com! Yey! I felt that way when I got one myself and yes ranking high in Top Blogs is really a big thing if you're taking this blogging thing seriously. About the blogger: I wasn't able to see your tweets but seeing it from here I felt mad! Popular or not, everybody deserves respect. 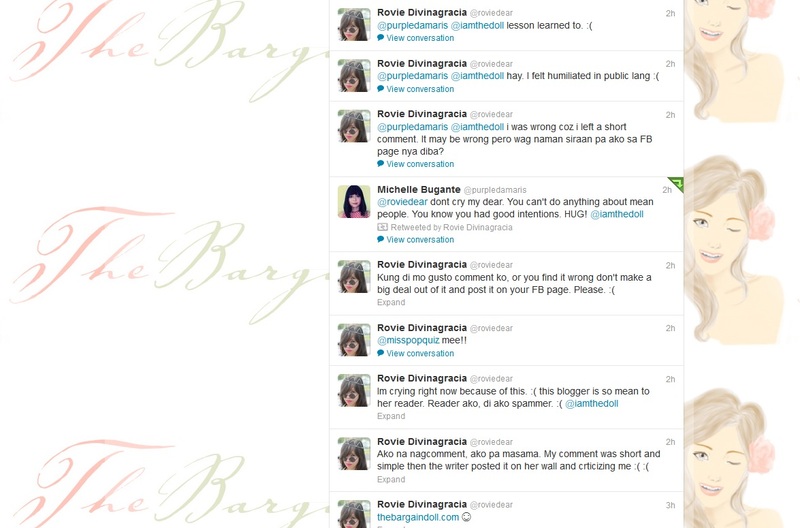 I guess that blogger is not popular at all because you don't know him/her (technically speaking). Arrrggggh! I just hate people like that. This is blogging for crying out loud! She could've lessen all the carbon footprints she had when she screen capped your comment and posted it on her page and ranting about it! OM! What a loser! Don't worry Rovie. God is with you! That blogger will be punished. dapat dinelete nlng nya comment mo kung ndi nya naappreciate. kaya ndi ako sumasali sa mga comment exchange. nakakairita naman. cguro ganun din sya kapag may nawrong grammar sa comments nya pinapahiya nya. you're readers,friends,family love you un ung important. dedma na ke echuserang froglette! I prefer longer comments but I don't think there's nothing wrong with short comments. Sometimes I give short comments too, myself. It's inevitable that sometimes I just don't have the time or I just can't relate to a post. I agree with every comment here. She should have just deleted the comment. No need to make it such a big deal. Don't let it make you feel bad. Remember, you can't please everbody. Congrats on your domain! Clap! Clap! Clap! Agree with you if you bloggers should treat their readers with respect. And I guess You really can't please everyone. Cheer up! That blogger could have just deleted your comment or chose not to publish it, or should have just sent you a DM if she felt offended by your post. Weird lang that she made a complete fuss out of it. thanks sai dear :) i apologize for ranting too i appreciate the kind words you're giving me. I was also at fault for not reading the post fully. lesson learned narin for me. proves na marami pa akong dapat matutunan :) thanks sai! And CONGRATS to you for having your own domain <3 Cheeerrsss! Congrats to your own domain Rovie dear. :) I am still curious about who the blogger is as I sometimes participate in comment exchange. Oh well do not worry because you have fellow blogger/reader who reads your entry (count me in). I wish you weren't such a lady and said who this blogger is, I could make sure her blog will be on my black list from now on. I've had a similar experience, not in blogging but still I said something with good intentions and I was attacked by many people for doing that, and I think I even got victim of the first mean sarcasm I heard from a person I'm very fond of. I think that such kind of reactions come when you hit a nerve. She is probably an insecure blogger who has a reason to fear comments on her website come from people spamming their one only and was trying to reassure herself she has a following by calling out to her loyalists to bash you with her. That's really mean of her. Anyhow, I hope you're okay and feeling better now.